Abstract: In this study the methodology proposed by Vogel & Marker (2010) to reconstruct the pre-AD 79 topography and paleo-environmental features of the Sarno River plain (Italy) was considerably revised and improved. The methodology is based on an extensive dataset of stratigraphical information from the entire Sarno River plain, a high-resolution present-day digital elevation model (DEM) and a classification and regression tree approach. The dataset was re-evaluated and 32 additional stratigraphical drillings were collected in areas that were not or insufficiently covered by previous stratigraphic data. Altogether, an assemblage of 1,840 drillings, containing information about the depth from the present-day surface to the pre-AD 79 paleo-surface (thickness of post-AD 79 deposits) and the character of the pre-AD 79 paleo-layer of the Sarno River plain was utilized. Moreover, an improved preprocessing of the input parameters attained a distinct progress in model performance in comparison to the previous model of Vogel & Marker (2010). Subsequently, a spatial model of the post-AD 79 deposits was generated. The modelled deposits were then used to reconstruct the pre-AD 79 topography of the Sarno River plain. Moreover, paleo-environmental and paleo-geomorphological features such as the paleo-coastline, the paleo-Sarno River and its floodplain, alluvial fans near the Tyrrhenian coast as well as abrasion terraces of historical and protohistorical coastlines were identified. This reconstruction represents a qualitative improvement of the previous work by Vogel & Marker (2010). Abstract: The Molise Apennines feature numerous relicts of paleosurfaces, mostly of erosional origin, which represent the remnants of gently-rolling ancient landscapes now hanging at different altitudes above the local base-levels of erosion. Their genesis can be related to prolonged periods of relative tectonic stability alternating with periods of uplift, or to the interplay between steady tectonic uplift and climatic fluctuations. Four orders of paleosurfaces were recognized: I (>1,100 m a.s.l. ), II (900–1,000 m a.s.l. ), III (750–850 m a.s.l. ), IV (600–720 m a.s.l.). The most ancient orders (I and II) are cut into the bedrock and are located at the top of the Matese and Montagnola di Frosolone massifs. The youngest paleosurfaces (III–IV), partially cut into Quaternary deposits, are found along the valley flanks of the main river systems and within the Boiano, Carpino, Isernia and Sessano intramontane basins. The present study deals with the dating of the Sessano Basin Paleosurface (SBP) which is related to the IV order and is cut into the basin infill. The 40Ar/39Ar age of a tephra layer (437±1.9 ka), intercalated at the top of the succession, supported by archaeo-stratigraphic, palynological and paleopedological data, allowed the SBP surface to be constrained to 350–300 ka. The SBP chronological position represents an important morphostratigraphic marker: it is the first ante quem and post quem date that allows the chronological position of the other orders of paleosurfaces to be better constrained. Abstract: Age constraints of geomorphological markers and consequent estimates of long- to short-term denudation rates from southern Italy are given here. Geomorphic analysis of the valley of the Tanagro River combined with apatite fission track data and radiometric dating provided useful information on the ages and evolution of some significant morphotectonic markers such as regional planated landscapes, erosional land surfaces and fluvial terraces. Reconstruction of paleotopography and estimation of the eroded volumes were perfomed starting from the plano-altimetric distribution of several orders of erosional land surfaces surveyed in the study area. Additional data about denudation rates related to the recent and/or active geomorphological system have been obtained by estimating the amount of suspended sediment yield at the outlet of some catchments using empirical relationships based on the hierarchical arrangement of the drainage network. Denudation rates obtained through these methods have been compared with the sedimentation rates calculated for two adjacent basins (the Pantano di San Gregorio and the Vallo di Diano), on the basis of published tephro-chronological constraints. These rates have also been compared with those calculated for the historical sediment accumulation in a small catchment located to the north of the study area, with long-term exhumation data from thermochronometry, and with uplift rates from the study area. Long- and short-term denudation rates are included between 0.1 and 0.2 mm/yr, in good agreement with regional data and long-term sedimentation rates from the Vallo di Diano and the Pantano di San Gregorio Magno basins. On the other hand, higher values of exhumation rates from thermochronometry suggest the existence of past erosional processes faster than the recent and present-day exogenic dismantling. Finally, the comparison between uplift and denudation rates indicates that the fluvial erosion did not match the tectonic uplift during the Quaternary in this sector of the chain. The axial zone of the southern Apennines should therefore be regarded as a landscape in conditions of geomorphological disequilibrium. Abstract: Pleistocene weathering, uplift rates, and mass movements have been studied and correlated in a key-area of the Italian southern Apennines. The study area is the Melandro River valley, developed in a tectonically-controlled Quaternary intermontane basin of the axial zone of the chain. The goal of this paper is to assess ages and geomorphic features of two paleo-landslides and to relate them to values of uplift rates and the climate conditions in the axial zone of the chain during the Pleistocene. Uplift rates have been estimated using elevation and age of flat erosional land surfaces. In the southern area of the basin, the landscape features a wide paleo-landslide which can be ascribed to the upper part of the Lower Pleistocene on the basis of relationships with Quaternary deposits and land surfaces. Another paleo-landslide, in the northern sector of the basin, can be referred to the beginning of the Upper Pleistocene. The correlation between the ages of the two landslides and the temporal trend of the uplift rates allowed us to hypothesize that mass movements occurred in response to uplift peaks that destabilized slopes. Additionally, deciphering weathering conditions by means of the analysis of mineralogical and geochemical signals from landslide deposits and weathered horizons allowed assessment of changes in paleoclimate scenarios during the Pleistocene. The deep weathering was probably caused by the onset of warm-humid climate conditions, which may have acted as a further factor triggering landslide movements in an area already destabilized by the rapid uplift. Abstract: We discuss a mathematical model for wave and run-up generated submarine landslides in the canyons of the Bay of Naples (Magnaghi-Dohrn canyon system). The morpho-bathymetry and submarine gravity instabilities of such incisions have been investigated through the interpretation of a high resolution DEM. The canyons are located in a sector of the bay where there is a variable interaction of volcanic activity (Phlegrean Fields and Ischia and Procida Islands) with sedimentary processes due to the Sarno-Sebeto rivers. At present the Naples canyon-system is inactive, as is shown by the Holocene sedimentary drapes deposited during the present sea-level highstand, but gravity instabilities occurred in the recent past at the canyons’ heads. In particular the Dohrn Canyon is characterized by a double regressive head, while the Magnaghi Canyon shows a trilobate head, formed by the junction of three main tributary channels and coincident with the retreat of the shelf break around the 140 m isobath. The results of a simulation of failures in the above source areas show that the amplitude of wave run-up, expressed in terms of the sea floor depth percentage, may range up to 2.5 % of the water depth at the sea bottom. Abstract: The Agri River high valley is a Quaternary intermontane basin located in southern Italy. The tectonic evolution of this basin was controlled by Lower Pleistocene strike-slip master faults, subsequently reactivated as normal faults until the Middle Pleistocene. The Quaternary sediments of the basin infill are mainly constituted of continental clastics, represented by coarse-grained alluvial deposits divided by unconformities. The arrangement of clastic deposits suggests that the Pleistocene to Holocene alluvial fan system developed along the eastern margin of the valley. Five generations of slope and alluvial fan systems have been recognized in the Agri basin. The oldest fans have formed on both slope and alluvial deposits. The younger alluvial fans are located along the entire valley floor and arose upon the earlier fan apexes originating in these valleys. The youngest fans are arranged in two different generations and show proximal facies distributed along the foot slopes. Plan view morphology, fan slope profiles, and sedimentary features of the fan system have been used here to determine the magnitude of the tectonic deformation episode affecting the faulted mountainous front of the Agri basin eastern margin. Both fast and slow tectonic episodes occurred during the different regional Quaternary tectonic stages that affected the southern Apennine chain. These tectonic episodes have therefore been analysed in relation to climatic conditions in order to determine their contributions to the evolution of the Pleistocene to Holocene fan systems. Abstract: Three sections (Taman, Popov Kamen, and Zheleznyi Rog) of the Upper Maeotian–Lower Pontian sediments of the Taman Peninsula (Eastern Paratethys) have been studied. The sequences represent continuous successions of the Maeotian and Pontian sediments. The transitional Upper Maeotian–Lower Pontian relatively deep-water sediments were formed at the time when Eastern Paratethys was connected with other marine basins. The facies are represented by thin clay layers interbedded with laminated diatomites and contain unusual diatom and nannofossil associations. The small size of coccoliths and the absence of zonal markers indicate that the influx of marine waters took place in the stressed conditions of a restricted basin. Diatom assemblages are more diverse and include the open-marine species Azpeitia aff. komurae and Thalassiosira maruyamica and marine endemics Actinocyclus aff. paradoxus, Rhizosolenia bezrukovii, Hemiaulus sp., Nitzschia miocenica of the tropical Nitzschia miocenica Zone and — the index species of next Thalassiosira convexa Zone appear in these part of the sections. Three stages of the Mediterranean marine invasion are distinguished; during the first one the connection between basins was rather permanent, for the two others its character became pulsing and not stable. The possible duration of the invasion is estimated from 6.4 to 6.1 Ma and belongs to the Early Messinian — to pre-evaporate deposits and lower part of lower evaporate deposits. Abstract: The Sarmatian-Pannonian transition has been investigated in Section A of Oarba de Mures in the central Transylvanian Basin. Micropaleontological assemblages are diagnostic for different environmental settings and demonstrate a clear zonation, which was used to reconstruct the genetic units. Five stratigraphic sequences were described and subdivided based on the microfossil assemblages. Transgressive intervals were documented by five-chambered and biserial planktonic foraminifera, normal regressions by assemblages with abundant mysid, dasyclads, diatoms, and benthic rotaliid foraminifera, while the forced regressions are characterized by reworking. 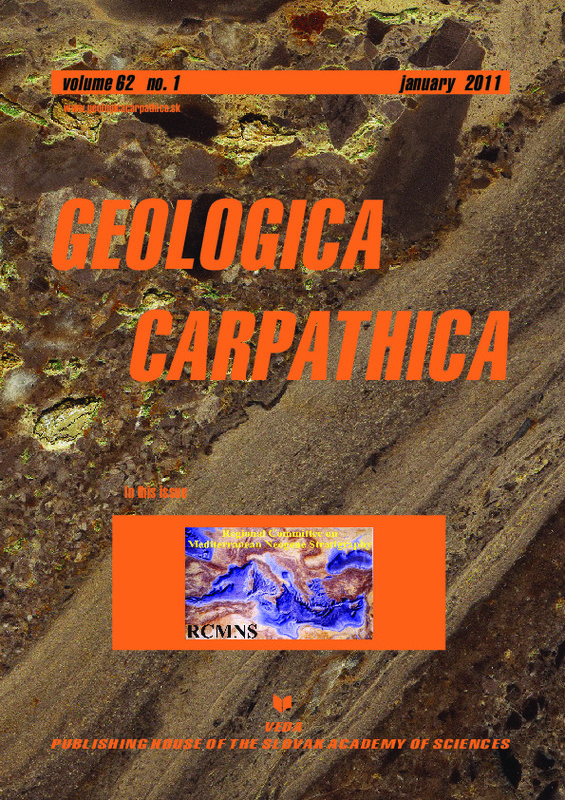 The Sarmatian-Pannonian boundary (11.3 Ma) is clearly documented by microfossils and is calibrated with radiometric and magnetostratigraphic data. A new interpretation for the interbasinal correlation is proposed by synchronizing the top of the Central Paratethyan Sarmatian with the top of the Eastern Paratethyan Bessarabian. Abstract: A new species of Niveria from the Middle Miocene (Badenian) of the Paratethys of Borsodbóta, Hungary is described. This species is characterized by its callused dorsum and dorsal depression. Niveria jozefgregoi sp. nov. is discussed with comparative species from the Badenian of Hungary, the Pliocene of the Mediterranean region, Florida and Recent species from Madeira and the Islas Galapagos.